What does “spay” and “neuter” mean? SPCA of Solano County will spay/neuter kittens when they’re eight weeks old and at least two pounds, and puppies when they’re eight weeks old and 2-4 lbs. (depending on the breed). It’s a myth that you can’t spay/neuter kittens and puppies when they’re so young; they actually bounce back from spay/neuter surgery very quickly! Pediatric spay/neuter is safe and is less stressful on the animal than waiting until he’s older. SPCA of Solano County believes that all animals should receive the highest quality veterinary care possible, even if the services performed are at a reduced cost. We do not cut corners or quality. All spay/neuter surgeries are performed by our licensed veterinarians (DVMs) and all animals entrusted to SPCA of Solano County are attended to before and after surgery by trained veterinary technicians. Every patient receives pain medication. 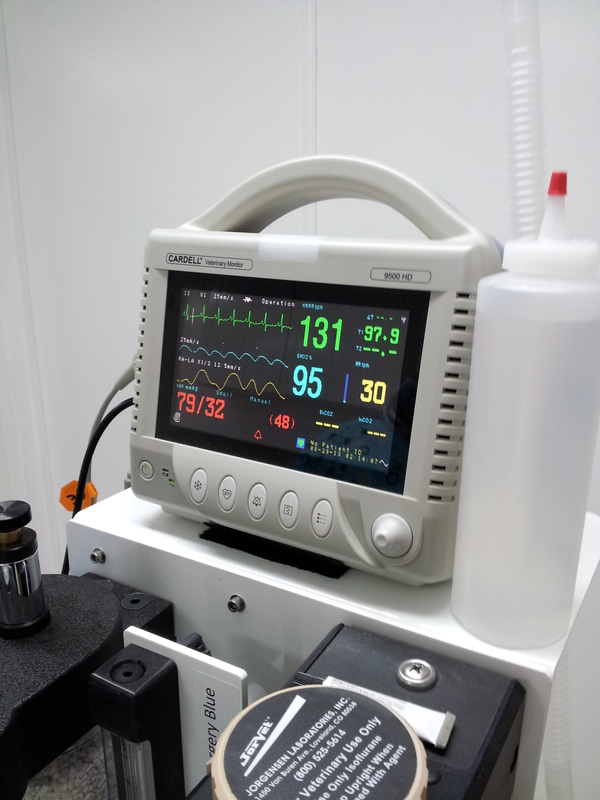 While under anesthesia, every animal has a state of the heart monitor on them so that any change in respiration, blood pressure, temperature and heart rhythm and/or speed can be detected immediately. After surgery, your pet will receive monitoring until he is moving his head and/or ready to walk, then he’ll be put in his kennel to rest. Every patient receives pain medication. Dogs are sent home with pain medication and the cats are given an injection of long lasting pain medication. The spay/neuter surgery only takes between 5 to 20 minutes. We prefer to wait about two weeks after the puppies/kittens are weaned before we spay the mother. The puppies/kittens must be completely weaned (eating solid food on their own, typically around 4-6 weeks of age) and separated from the mother. For my kids birthday, they were thinking about asking for pet supplies instead of presents. They they wanted to donate them to the animal shelter or a local rescue…would you guys accept that type of donation? 🙂 We hope so! We absolutely accept donations like that. We survive on donations and anything helps. We always need kitty litter, paper towels, garbage bags (kitchen & garden size) blankets, towels, etc. Thank you so much for thinking of us!